The screen is in its original position, with the standard segments in the front. An inset, shown in the lower right, is an enlargement of the solenoid and index wheel under the purple segment on the left, just above the motor. The motor is at the lower left. The solenoid has pulled in, pulling the lever arm out of the notch in the index wheel. The motor has started to rotate. The motor continues to rotate the index wheel which rotates the screens. There is a leather clutch between the index wheel and the motor, allowing the motor to turn without moving the screen. The motor continues to rotate the index wheel and the screen. The solenoid released, allowing the lever to rest on the outside of the index wheel. Note the next notch coming up on the index wheel. 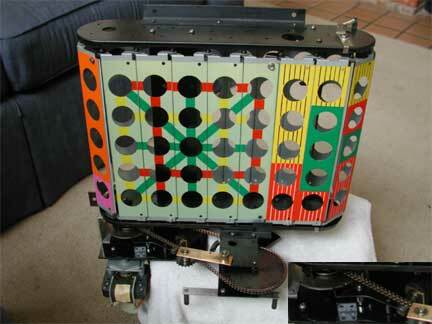 The lever falls into the next index wheel slot, corresponding to the next screen position. The motor shuts off. The screen is now in a new position. The motor in the lower right of the picture, works through a leather clutch to rotate a notched wheel in the bottom track of the magic screen. Each screen has a peg on the bottom that engages this notched wheel, causes the screens to rotate. The motor also rotates the chain through an idler gear to a large wheel in the center bottom of the picture. This wheel rotates a large wheel with electrical fingers and contacts, informing the game what the current position of the screen is. This information is used to determine winning positions.